Flaky & buttery puff pastry filled with fresh whipped cream, sweet strawberries, and topped with a dusting of powdered sugar. 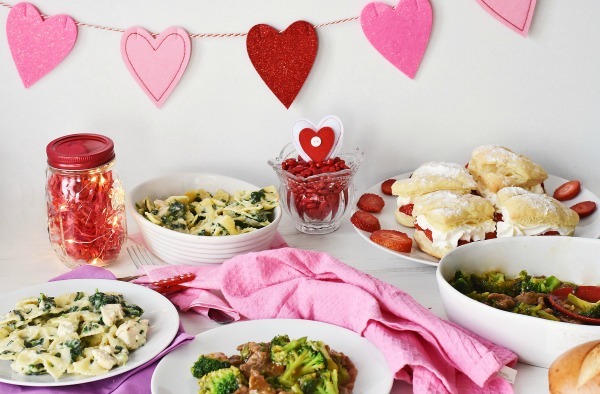 Valentine’s might be four days away but that does not mean you can’t enjoy a date night at home with your significant other tonight. When you are a parent of young kids, sometimes those type of dates are your only choice. For us, we often celebrate holidays and milestones after the kids are tucked away in bed. 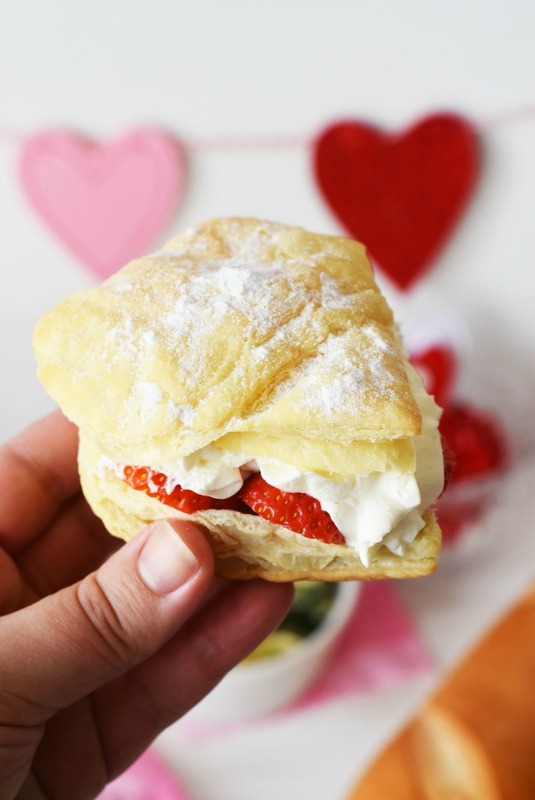 That is why today I wanted to share these Strawberry Cream Puffs & Date Night in Ideas. Not everyone is a chef, nor wants to cook for a date night. I totally get that too! While I do like to enjoy a nice meal, I really do not always feel like cheffing it up for a night in. Sometimes I even take out, or purchase a quality frozen meal for two. 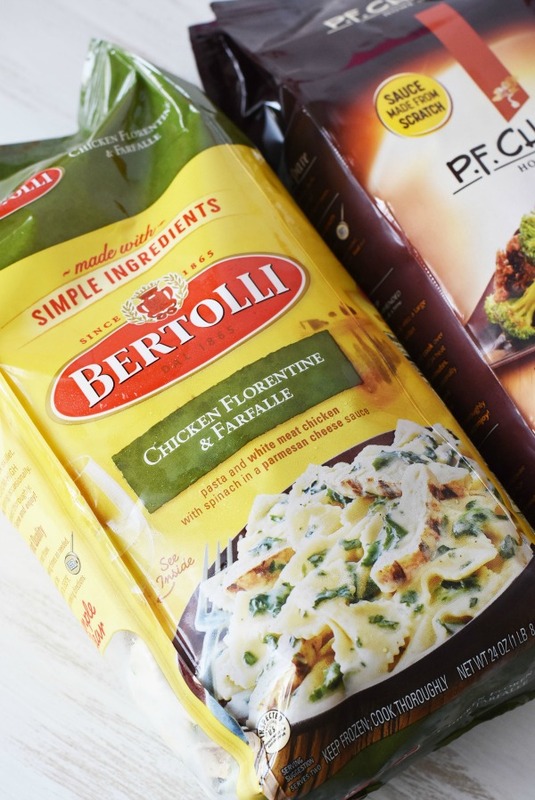 We picked up a bag of Bertolli Frozen Chicken Florentine, and P.F. 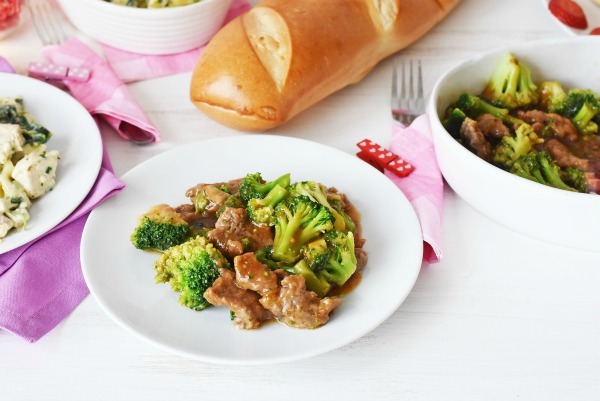 Chang’s Frozen Beef and Broccoli. 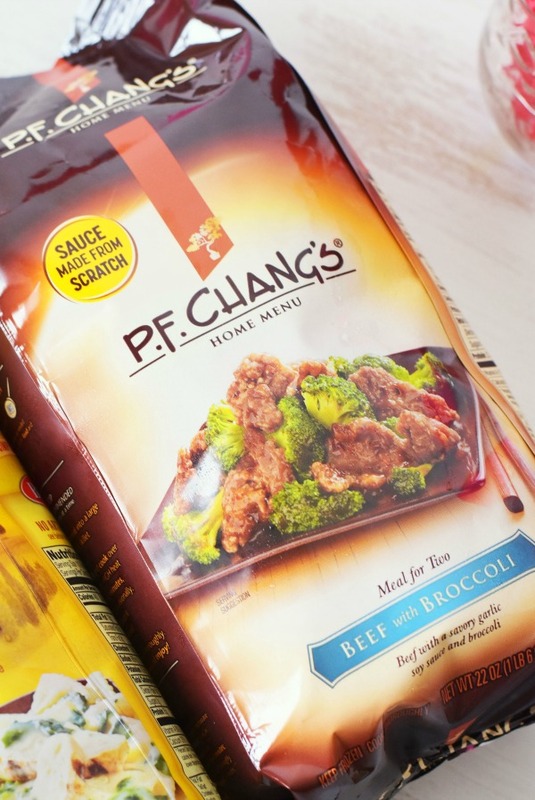 These meals can be found in the frozen meals section of your local Walmart. They were priced just under $7 at our New England location too! Ready in minutes, these meals can be oven cooked, or microwaved! However, the flavors and freshness are so authentic and tasty that you would never know they were frozen! 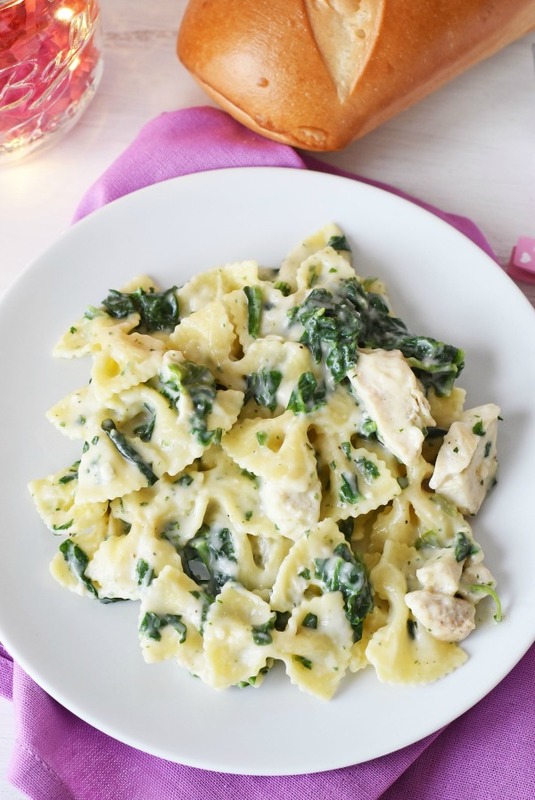 Bertolli Frozen Chicken Florentine is made up of farfalle pasta cooked up al dente. Grilled white meat chicken and tender spinach are prepared in a luscious sauce made with white wine and Parmesan and Romano cheeses. 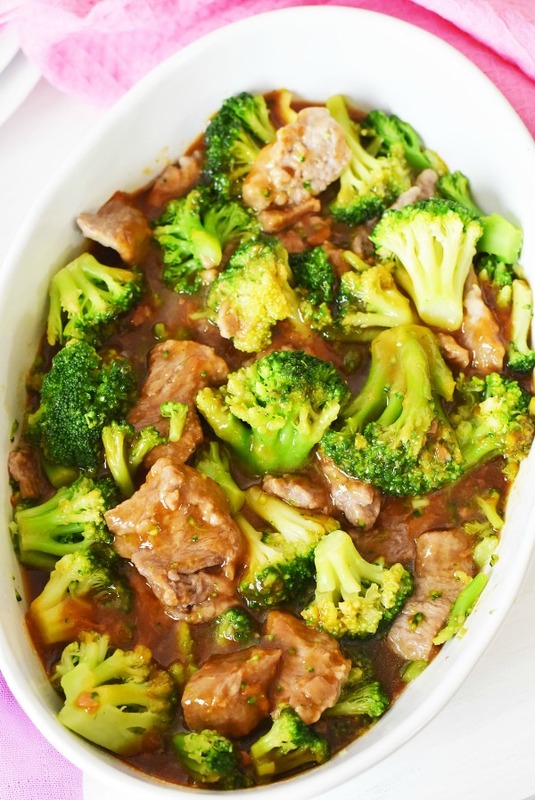 PF Chang’s Frozen Beef and Broccoli features marinated beef and crisp broccoli drizzled with savory garlic soy sauce. We actually made both varieties of these meals and had leftovers for lunch the next day since they give a generous “for two” portion of each. No dinner is complete without a tasty dessert. These Strawberry Cream Puffs were mighty yummy too! These were also easy to make! Date nights in can be for any occasion, but since Valentine’s is around the corner, I added some fun touches. I filled a mason jar with red paper filler and battery operated string lights for ambiance. A crystal candy dish filled with hearts brought the table together. 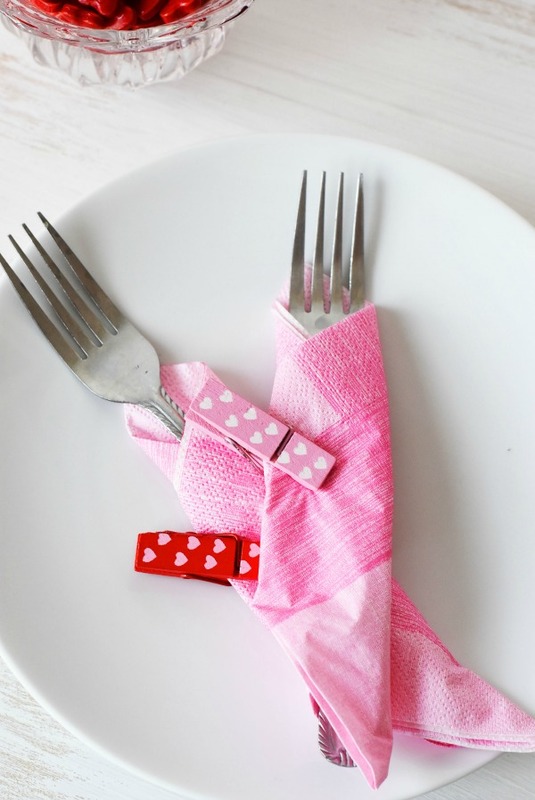 I also wrapped the forks with pink paper napkins and secured them with tiny clothespins. Jared really liked the meal and I will be recreating it again with some different varieties from PF Changs and Bertolli. 17.3 oz puff pastry (1 box) at room temp. Preheat oven to the temperature required by your puff pastry packaging. In a large bowl add the heavy cream, extract, and 2 tablespoons of powdered sugar. Mix on high for 3-5 minutes until stiff peaks form in the cream. Add cream to a piping bag with a large star tip. Place cream in the fridge. 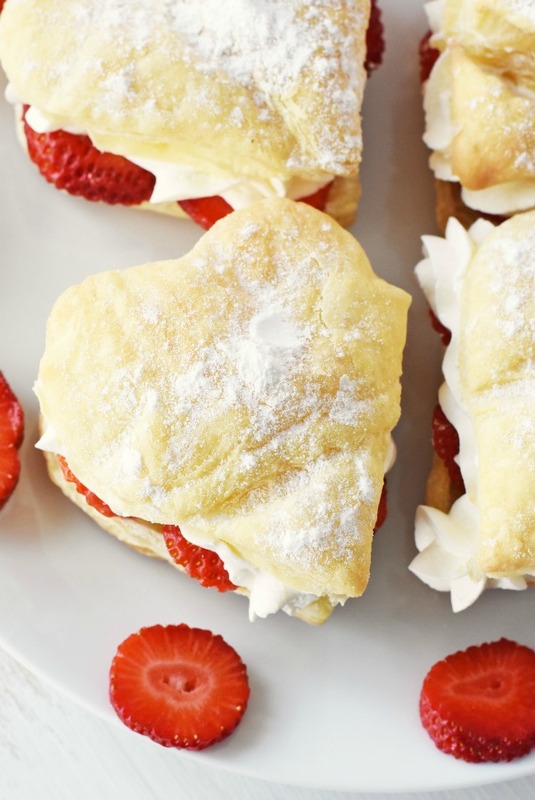 Cut out your puff pastry hearts, or slice them into even rectangles. Finish off with a sprinkle of powdered sugar, and you have a tasty dessert. This is such a great idea! I might have to send this post to my husband because I’m constantly trying to get him to cook dinner for me. (The last time he cooked for me was before we were married!) LOL. I love that this is simple with very little clean up and is totally something he can make on his own without destroying my kitchen! Yum! Those look so delicious! I will definitely have to make some of these! Looks so good! This is a perfect Valentines day meal. 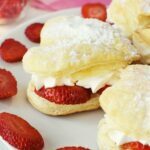 The Strawberry Cream Puffs will be so delicious for dessert. I can not wait to try them. 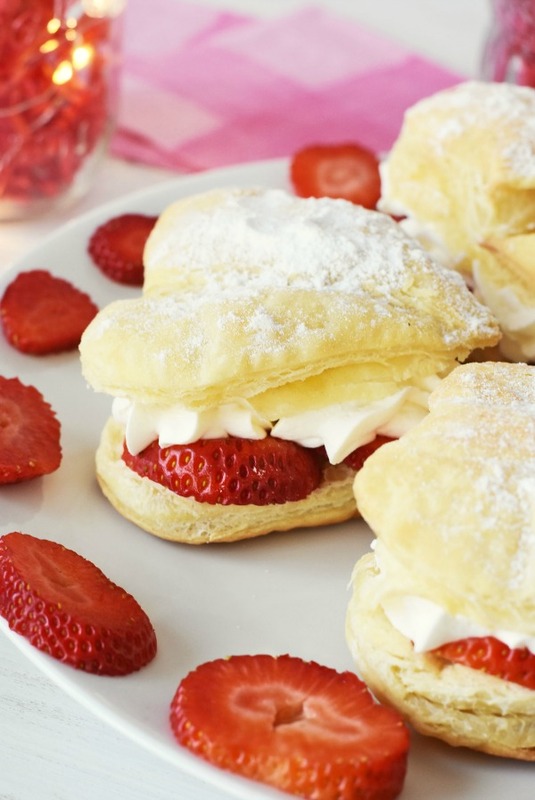 These Strawberry Cream Puffs are so cute! My family will surely enjoy these! Everything here looks great. Those cream puffs look amazing! I need to make those. I know my girls would love them for Valentine’s Day. 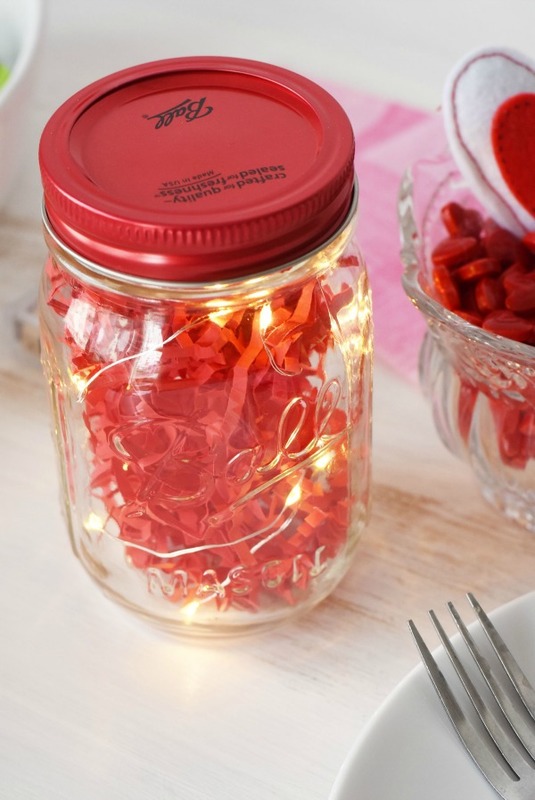 The mason jar with the lights is a cute idea. No need to worry about anything catching on fire during a romantic night. All that food looks delicious especially your strawberry cream puffs. Even if its not for date night these meals sound fantastic! Some nughts,I just do not feel like cooking and that is where these would be great! What a fun Valentine’s Day idea! With V-Day being in the middle of the week, this would be a great way to have a romantic dinner at home! Thanks for the idea! How many oz of puff pastry dough? Hi, it is one package. I am not sure of the ounces of the full package.